This article explains how to create an extension in Evolution as well as how to point your Polycom phone at the provisioning server. After the subjective information has been input into the appropriate fields, be sure to click on save to create the extension. At this point the extension has been created in Evolution and the phone needs to be told how to find its configuration on the server. To do that we will need to connect the phone to the network and ensure it has power. When a Polycom SoundPoint IP Model phone boots it immediately starts a 10 second countdown before it attempts to reach out to the provisioning server to download its configuration. During the countdown you are prompted with a few soft keys on the bottom of the LCD: 'Setup', 'Start' and 'About'. After selecting 'Ok' you will be prompted with another menu that includes the ability to enable/disable DHCP or change the phone to a Static IP address, as well as a 'Server Menu', 'SNTP' Address', 'GMT Offset', DNS configuration, an 'Ethernet Menu', and a 'Syslog Menu'. In order to provision the phone, you will need to modify the server type and the server address, specifying valid values so the phone can find its configuration on your Evolution PBX. To do that, using the arrow keypad on the phone, highlight 'Server Menu' and click the 'Select' soft button. 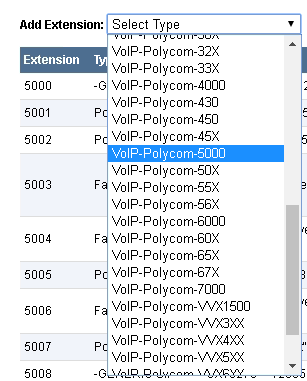 For a phone that is on the same LAN as Evolution (local to the PBX), select TFTP or FTP. For a remote phone, or a phone over a more complex network (I.E. 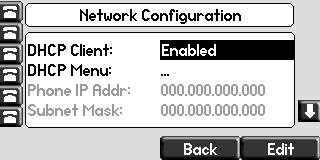 a VPN, or MPLS) select FTP. Once you have defined the Server Type, select the 'Ok' button near the bottom right of the LCD. After specifying the server type for the download, you will need to tell the phone where the server is. Using the arrow pad to navigate, highlight the 'Server Address' field and select 'Edit'. Alternatively, you can use the check-mark in the center of the arrow pad to enable editing of this field. The server address can be put in as a Fully Qualified Domain Name or the IP Address of the server. After selecting the 'Edit' key, a third soft key appears to the left of 'Ok'. This key, labeled as 'a ->1A' or '1/A/a' (depending upon the phone model; more on this below) allows you to change the input type for the value you are inputting into the field. To input a period, use the * key. Special characters ( / or ~ for example) can be input by selecting the 'A' input and using the '#' button on the numeric keypad to cycle through the available characters. After entering the server IP address or FQDN in the 'Server Address' field, be sure to save you changes by selecting the 'Ok' key. 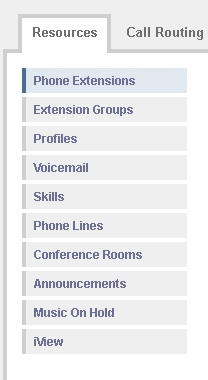 At this point, the phone should have a valid server type as well as a valid server address in the appropriate fields. You will need to hit 'Exit' twice, until you are prompted to 'Save and Reboot' the phone. After the phone reboots it will start the the countdown again, as we have already configured the appropriate fields, you can now select 'Start' to start the provisioning process. Your only option is to select 'Cancel' to interrupt the phones booting process after which a Polycom Logo is displayed momentarily, followed by a countdown that provides a few soft keys options (Start, Setup, About). 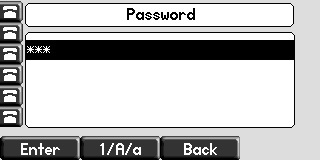 You will need to select 'Setup', after which you will be prompted for a as password. Enter 456 and select 'Ok'. A new menu will display that starts with 'Provisioning Server'. 'Provisioning Server' should be highlighted by default, if not use the arrow pad to highlight it, and choose the 'Select' button. You should now see a DHCP Menu as well as Server Type, Server Address, Server user, Server password, FIle Tx Tries, Retry Wait, etc. Using the arrows to highlight your selection, scroll to Server type and select 'Edit'. Using the left and right arrows, choose the server type. 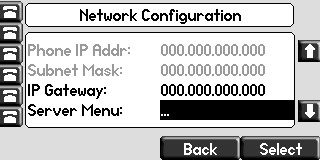 Now you will need to configure the 'Server Address' to tell the phone where its configuration is. Using the arrow pad to navigate, highlight the 'Server Address' field and select 'Edit'. 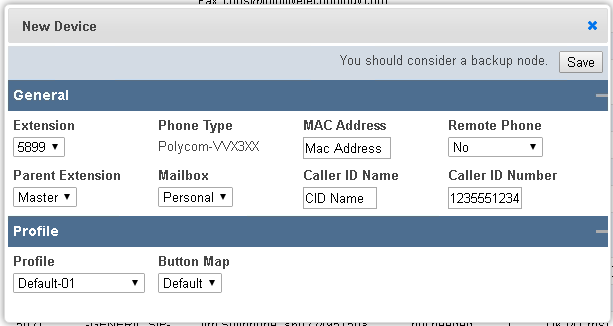 Alternatively, you can use the button in the center of the arrow pad to enable editing of this field. The server address can be put in as a Fully Qualified Domain Name or the IP Address of the server. After selecting the 'Edit' key, a third soft key appears to the left of 'Ok'. This key, labeled as 'a ->1A' allows you to change the input type for the value you are inputting into the field. After you have entered the Domain Name or the IP Address be sure to save your changes by selecting 'Ok'. At this point, the phone should have a valid server type as well as a valid server address in the appropriate fields, select 'Exit' twice until the phone starts a count down again. After the countdown has elapsed, or you hit 'Start', the phone will return to the 'Starting application, press cancel to interrupt' screen. As it continues to boot you should see multiple status screens advising on the processing of the config, followed by the phone coming online.